This entry was posted on Monday, February 8th, 2010 at 1:23 pm	and tagged with close-up, depth of field, people, Photography, portrait and posted in People, Photography. You can follow any responses to this entry through the RSS 2.0 feed. She looks like a flower elf. Good entry! Loved the part about your children’ growing up experience. 🙂 Stunning picture to introduce your girl. Wow! Nice shot man! Good flowers, I really like it! love the details, the contrast of “out of focus” and vivid sharp foreground! adore the colours and of course, your daughter’s cute little face-:) keep it up. I have a dream, a dream to take up photography too…but maybe not now, just yet. Thank You for your responce! Wow, very neat photo, great job! First blog & reply for me today!!!! Interesting point about following the older sibling, good ol Big Sis was always there to do the present wrapping, remembering the birthdays etc and as you say was always there to hide behind, should the situation arise. Guess now i’m 43 I should be remembering birthdays etc, lucky for me my wife seems to remember them better than I do (maybe its a gender thing? 😉 ) Nice portrait and dof, good subtle lighting. Stopped over on from the WP home page.. stunning pic, this. Wait until she gets a little older – than all the worries start. It is great to have a daughter but, my goodness, what a worry!!! I remember that little girl’s violin recital! Great picture. 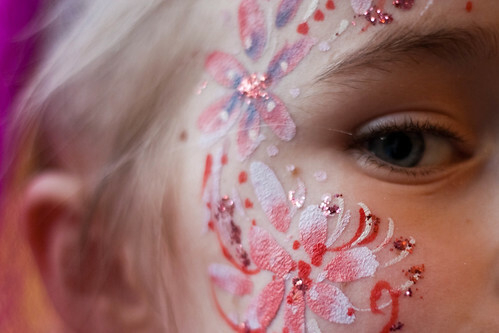 Shall try and copy this Beautiful Face Art on my Girls. Believe in Yourself and your Artist will Shine Through. Wow. And wow again! This post has now had 1700 hits in one day. Thank you all and I hope at least some of you will come back! The fact that so many of you like my picture means a great deal to me. Cheers! love the details, the contrast of out of focus and vivid sharp foreground! adore the colours and of course, your daughters cute little face-:) keep it up. I have a dream, a dream to take up photography toobut maybe not now, just yet. What an extraordinary photo. (Congrats on making the “front page” of WordPress.) I love the depth of field. I don’t use my 50mm as much as I should. I shoot gardens and landscapes primarily but on the rare occasion I grab a great shot of one of my sons, I’m thrilled – as you must be with this photo. Thanks Melissa. I am thrilled and I have no idea why I made front page. I don’t use the 50mm as much as I should either but after today I might have to. Hi Mark! Firstly, nice shot. Love the close-up and short depth of field. Secondly, enjoyed your musings on growing up and growing friendships. Thanks for sharing. And Thirdly, congrats on making front page of wordpress (that’s how I found you.) Enjoy the increased patronage of your blog! I’ll be sure to come back and check out your landscapes. It’s nice when people take the time to leave comments, isn’t it?! I think you captured this very well and it’s understandable why you made the Home page of WP. This photograph says a lot without there actually being too much. Congrats! Congrats on making the main page, from a fellow photographer! I like this entry. You seem to have a very balanced approach to how your daughter is navigating her way through this complicated, harried culture. It’s not easy, I know. I have teenagers myself and if it’s not already hard enough finding my own way, it’s sure another story when we have to guide our kids through it. I think the interesting thing about the “confidence” that comes with the wild hair and makeup, etc. is that it’s really like playing, like having a medium for amplifying aspects of ourselves. I believe that we humans have an innate need for theatre, expression, drama, entertainment…all sorts of things like that. It’s innocent and childlike and beautiful. What a shame that it gets exploited by those who just want to make money. But true artistry…ah, that’s something else altogether. Enjoyed your blog ! Your pics dont look like you are an amateur photographer though… decided this week to take up photography again…so I know what exactly “amateur” means! Good work.